My annual pilgrammage with my friend, Kathie, (sister Julie and friend Gayle caravanning behind us) to the Farm Chicks Show in Spokane was the first weekend in June. A good time was had by all. We did some of our traditional activities; Friday night dinner at Chaps (the lobster mac & cheese was delicious), Saturday lunch at The Elk Public House where I discovered their Roasted Corn Pasta Salad, spare time spent perusing local boutiques, Tangerine, Roost, Lolo, Artemis and our favorite, Pink Salvage Gallery. And of course, we stayed at the Davenport Hotel. We also tried some new things; lunch at Picabu Neighborhood Bistro– excellent, Saturday night Farm Chicks Soiree at Casper Fry Restaurant – excellent & worth going to again. The Farm Chicks Show was good…I’m not saying great because, unfortunately, there was no early admittance this year like last year. Immediately, there were very heavy crowds to contend with. Unfortunately, we were not the first in line this year. We thought we were second in line until a couple of hours into our wait, the dozen friends of the Canadian couple in front of us joined them. So we went from second to fourteenth. Needless to say, we were irritated. While I’m on a roll about irriatants, let me add children, babies, stollers & heterosexual husbands to the list. Let me explain….typically, I like children; I even have a few of my own. However, at this event, parents who bring children should be reported to Child Protective Services. Farm Chicks is not a fun, family event. It is an event with wall to wall intense, crazed women on a mission in search of treasures….I am surprised I haven’t witnessed any brawls or stampedes yet, but, there’s always hope. Besides, it not being enjoyable to the children, babies and husbands involved, they take up valuable maneuvering space and we need our maneuvering space! We were almost the first ones in when the doors opened, but we only lasted a couple of hours because is was so claustrophobic. Some of the treasures I got included an old painted black windsor rocking chair with the crest of Miss G.’s college on it, a set of six industrial cake pans connected so you can bake six layers at once, and an old wood podium. Heaven only knows why I buy some of this junk stuff. My biggest score, though, was for a client and not even at farm chicks, but at Pink Salvage Gallery. 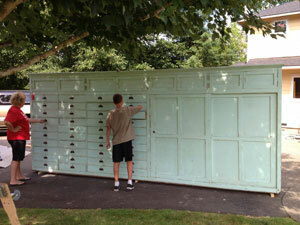 Kathie spotted the 16 foot long, faded aqua blue, floor to ceiling cabinet salvaged from an old elementary school first. We both racked our brains on how to fit it in our own homes to no avail. Then, I remembered a two story addition I designed being built right now which includes a large craft room. I had shown cabinets being built along one wall, but by pushing a door over a few feet, there would be room for the magnificent cabinet. I texted a picture over to my client, who has exceptionally good taste, and voila!, she loved it, too. Pink owners, Lana and Erica, were great in helping with the logistics of getting it moved 300 miles away. Now it is almost ready to go in the addition. Kathie has stated that once the cabinet is installed, she will visit the craft room once a week to drool over it. I will probably join her. Cook fusilli al dente and cool under running water. Cool. Combine corn, onions, butter and oil on a baking sheet and roast at 400 degrees until the onions are translucent and tender. Check often, but this took me approximately 15-20 minutes. Cool after removing from oven. 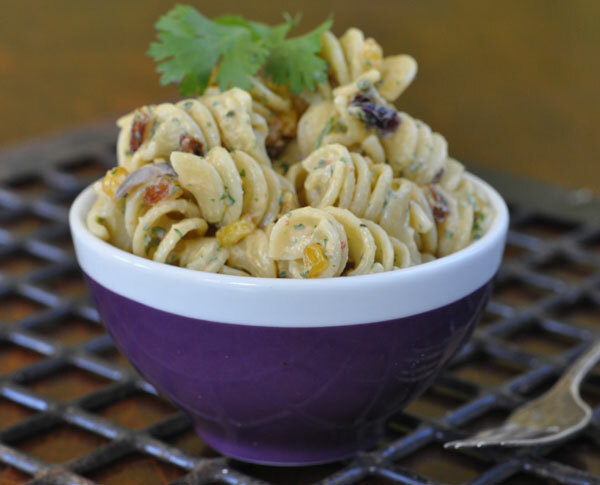 Combine chipotle puree, cilantro and mayo in food processor and puree. Mix together pasta, corn mix and dressing. Add salt to taste.